1. Seal air leaks between the warm interior and the attic or cathedral ceiling. 2. Add more ceiling insulation. 3. Improve ventilation between the top of the insulation and the roof sheathing. 4. Install self-adhering, waterproof roof underlayment. the roofing and into the house. While the first two steps can reduce or eliminate the chances of ice-dam forma­tion, ventilation is a less likely fix, and a waterproof membrane will only minimize the damage. It won’t prevent the ice dams from forming. Most ice dams are caused by flaws in a home’s air barrier. If you don’t have access to a blower door, the only way to diagnose air leakage to attics is to crawl up there and look around. Common points of air leak­ age through a ceiling are along top plates, at mechanical penetrations, and around recessed lights. Many of these trouble spots can be sealed with spray foam. Some areas around a chimney, for example may require other measures. Once you’ve plugged all the air leaks, check the insulation levels. The latest version of the International Residential Code requires R-49 ceiling insulationin climate zones 6, 7, and 8. In these areas, ceilings need a mini­mum of 14 in. of fiberglass batts, cellulose, or open-cell spray foam. If you’re using blown-in fiberglass, you’ll need about 20 in. to achieve R-49. In climate zones 4 and 5, you’ll need a minimum of R-38 insulation in the ceiling. That means at least 11 in. of fiberglass batts, cellulose, or open-cell spray foam, or about 15 in. of blown-in fiberglass. In houses where there isn’t enough room to get R-38 or R-49 at the perimeter of the attic, the best thing to do is to install as much closed-cell spray polyurethane foam as the space permits. In some cases, it may be necessary to install additional rigid-foam insulation on top of the existing roof sheath­ing. Of course, many energy smart builders choose to exceed these code minimum requirements for insulation. In the past, code minimum insulation requirements were woefully inadequate, and almost every cold climate home leaked enough heat to generate ice dams. 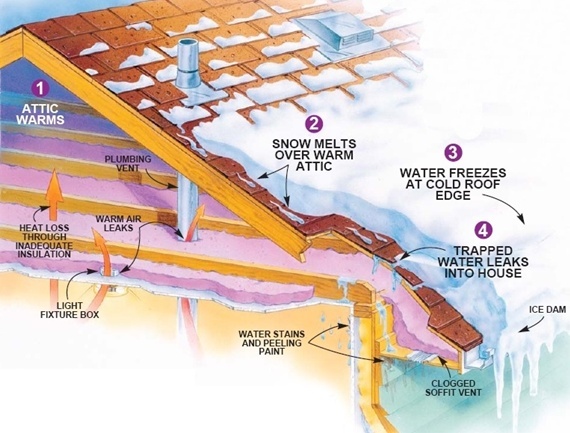 Many building inspectors, noting that attic insula­tion was code compliant, falsely concluded that the only way to stop ice dams was by improving ventilation. These days, if your ceiling is airtight and is insulated to the lat­est building code requirements, ice dams are far less likely. Although so called hot roofs (roofs with­ out ventilation) can work well, ice dams can still form on a hot roof if snow is deep enough because snow is an insulator. If your roof is covered with 2 ft. of fluffy snow, the bottom of the snowpack is insulated from cold outdoor temperatures. That raises the chance that meltingwill occur. If you live in an area with very snowy winters, you prob­ably want to stick with a ventilated roof. Again, ventilation should always be the third step in fixing ice dams. If ridge vents are added without proper air-sealing, escaping attic air can depressurize the attic, increasing air leakage through the ceil­ing. The best ventilation channels include a balance of soffit vents and ridge vents. 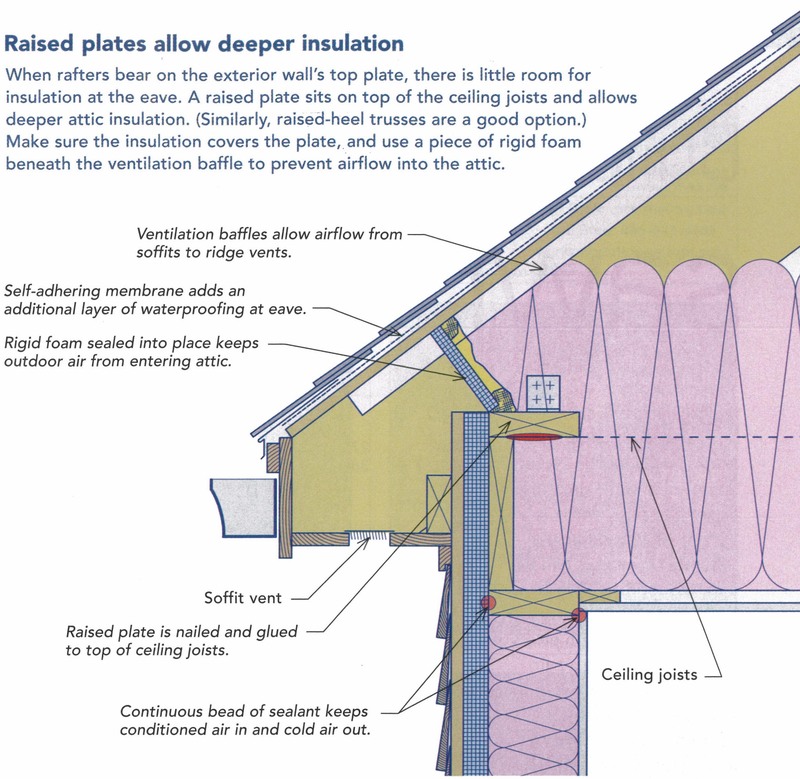 Also, remember to install insulation dams at the perimeter of the attic to keep from spilling into the soffits and to prevent unconditioned air from flowingthrough the insulation and lowering its per­ formance. Dams are provided with some brands of ventilation baffles, or they can be cut from pieces of rigid foam. Ideally, insu­lation dams should be sealed at the edges with caulk or canned foam. 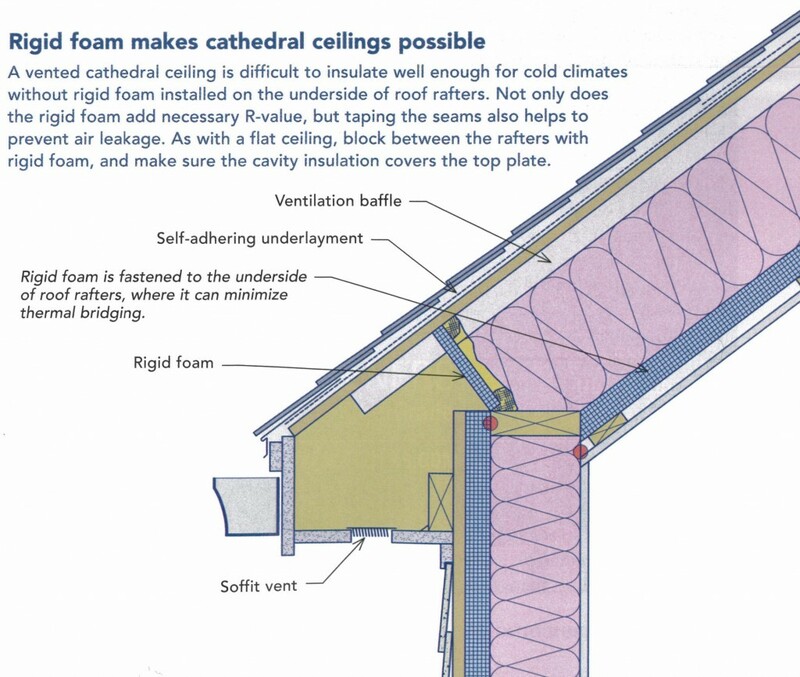 Cathedral ceil­ings need an air barrier between the top of the insulation and the ventilation channel. No roofing underlayment will prevent ice dams. What a waterproof underlaymentwill do is limit the damage caused by any ice dams that form by minimizing the chance of water leakingthrough the roof. In other words, it is relatively cheap insur­ance and is the best practice in most roofing installations. When reroofing, install a self-adhering underlayment extending from the eaves to a point 3 ft. higher than the plane of the exterior wall.